IL-1 was originally identified and cloned as a lymphocyte mitogen and much later, was found to be comprised of two closely related but distinct proteins, interleukin 1 alpha (IL-1 alpha) and interleukin 1 beta (IL-1 beta). Both these proteins bind to the same cell surface receptor. IL-1 is primarily released from stimulated macrophages, but is also released from several other cell types. Along with other IL-1 gene family members, IL-1 beta falls within a cytokine gene cluster on chromosome 2. It plays a key role in inflammatory and immune cell processes. 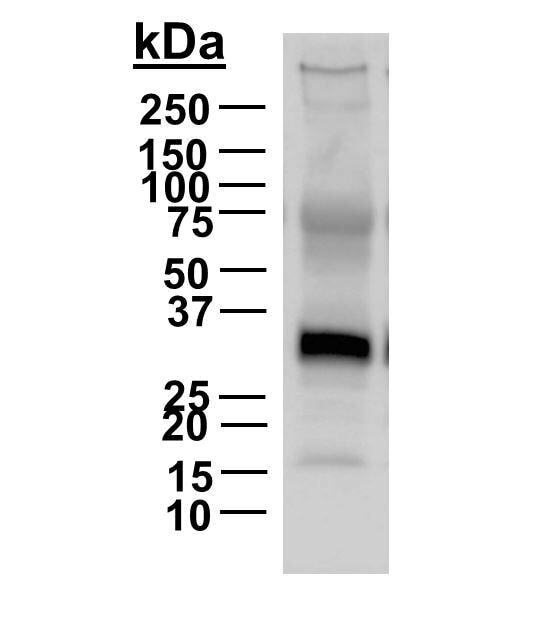 Western Blot: IL-1 beta/IL-1F2 Antibody [NB600-633] - analysis of IL-1 beta in Rhesus fetal membrane using anti-IL-1 beta antibody. In their 2009 Nature Medicine publication, French researchers employed the IL-1 beta antibody in their studies demonstrating that the NLRP3 inflammasome complex is a key link between the innate and adaptive immune responses against dying tumor cells (1). Additionally, Shchors et al from the UCSF Cancer Center investigated a myc-dependent angiogenic switch in endothelial tumors using the IL-1 beta antibody. They were able to map out a complete in vivo pathway by which myc can trigger rapid islet angiogenesis in an IL-1 beta-dependent manner (2). Such results provide key understanding into how the highly pleiotropic myc oncoproteins trigger increased vascularity to allow aggressive tumor progression. Arendt et al relied upon immunoblotting and immunoprecipitation with the IL-1 beta antibody in their breast cancer studies focused on how obesity drives CCL-2-mediated macrophage recruitment and angiogenesis (3). Their work establishes some key connections between obesity and cancer pathogenesis in postmenopausal women. The IL-1 beta antibody enabled Carmi's group to establish the importance of IL-1 and IL-17 in dictating whether the lung cancer cell microenvironment tips toward inflammation/tumor progression or antitumor immunity (4). Furthermore, Roche et al at the National University of Ireland performed ELISA assays with the IL-1 beta antibody in their studies on the in vivo modulation of pro-inflammatory cytokines in the brain and plasma by cannabinoid receptors (5).